12th day of the Kiwi Challenge, today's topic is "Time to get creative". 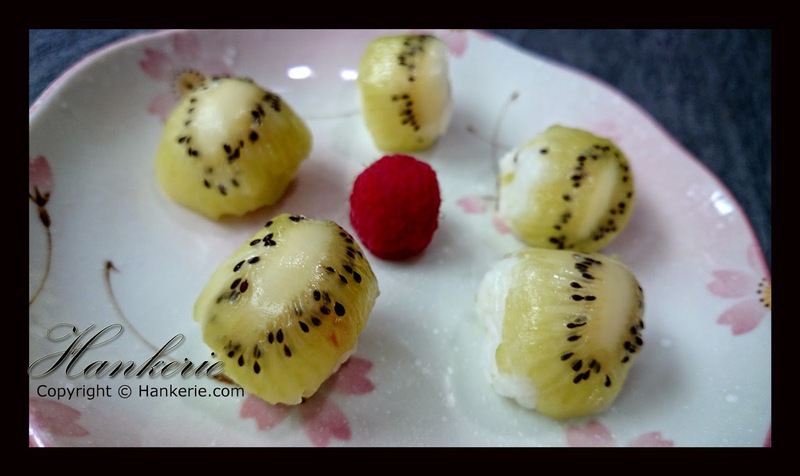 Inspired by the goodness of Zespri Green Kiwifruit, I spice up my Friday using kiwifruit to create mini Kiwi Ball dessert. 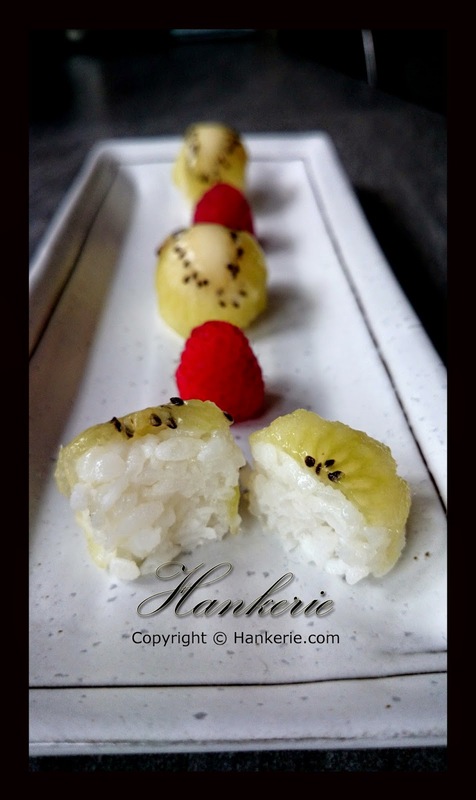 Follow by my yesterday post on Homemade Kiwi Sushi which is normal savory sushi, this inspired me to make them into sweet dessert that going to give you a kick after the meals. I serve them with fresh raspberries for the whole combination. It brings the vivid colour for your eyes first, and indeed they are delicious too. 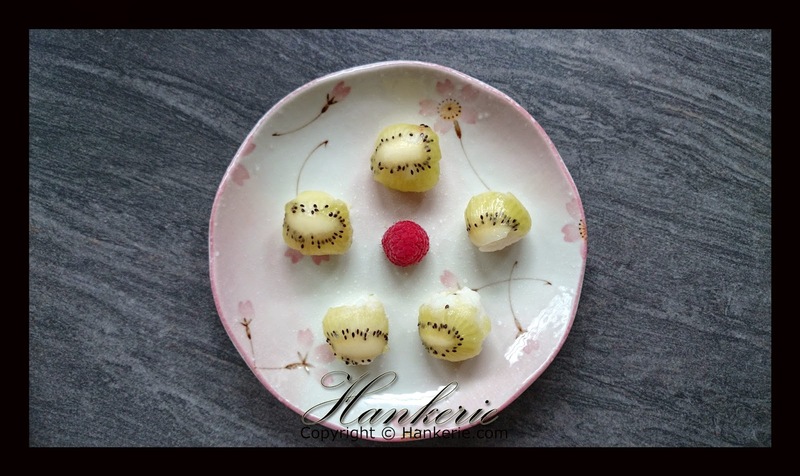 The method in making these Kiwi ball are same when the traditional making the savoury sushi but the only difference are some of the ingredients are totally varies. What it bring the Japanese rice comes together is the coconut milk. If you could not find the fresh coconut milk from your country, you can always substitute them with UHT coconut cream or heavy whip cream. After rice cooked, in another pot, combine the rice with water and sugar. When cool, gently add the coconut milk mixture and mix to combine. Wet your hands, and scope small section of the rice in your palm; and shape into round shape. Optional: If you would like some filling in the kiwi ball, you may stuff the paste or kani inside. 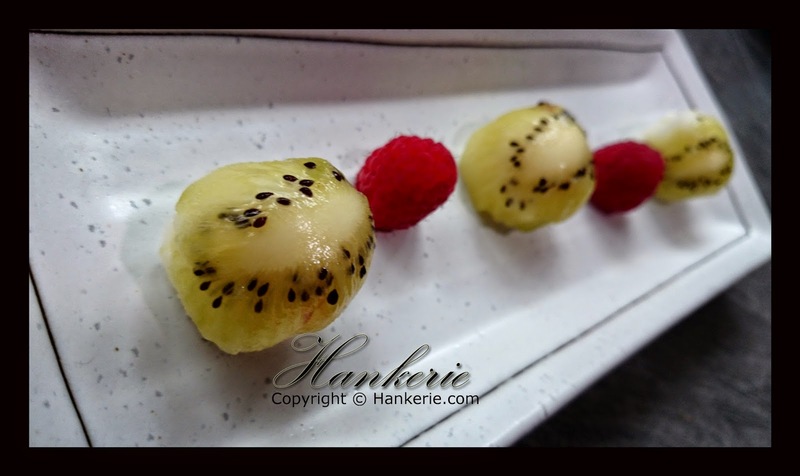 Decorate with green kiwifruit slice on top of the kiwi ball, and serve together with fresh raspberries.